They are authentic, high quality Barossa Valley Fine Wines full of character, gracefully built and not over-powering, wines with elegance and finesse! Shiraz being the hallmark of the Barossa Valley is our main grape: we produce “SCENIC ROAD” Shiraz and “THE GRAND Reserve Shiraz". Our blend “THE CLUB GSM” represents the other ‘Regional Hero’ of the Barossa Valley, the famous GSM- blend of Grenache, Shiraz, Mourvèdre. 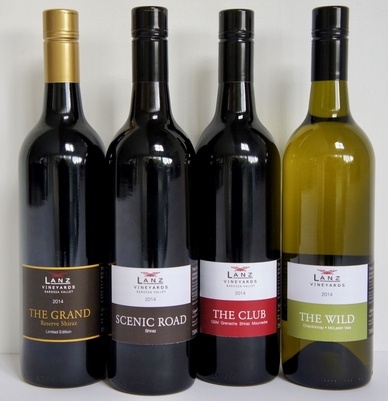 The LANZ Wines are savoury and fruit-driven, they show the whole spectrum of their varietal flavours and aromas. They let you discover their complex and harmonious combination of fruit flavours and spiciness, with their fine tannins they are excellent food wines. Their structure and minerality contribute to their longevity. They drink well from release (about 2 years), their cellaring potential varies between vintages, we recommend 6-12 years. The LANZ Wines are a natural expression of their provenance, of their terroir, of each season’s growing conditions, of the viticulturalists’ care and the winemaker’s art. The LANZ Wines are single vineyard wines, mainly hand-picked, some of them only made in the best years. They are aged in a combination of French and American new and used barrels.